Dave Blaney kicked off sprint week at Volusia Speedway Park on Tuesday night as he took the top spot in DIRTcar Nationals sprint car open practice. Blaney, the 1995 World of Outlaws Sprint Car Series champion, set the fast time in his Heinke Baldwin Racing car during the second hot laps session with a lap of 12.724 at more than 141 mph. Taking the top spot is a confidence booster for the week, Blaney said. A total of 15 teams took part in the optional practice in the lead up to the UNOH All Star Circuit of Champions events Wednesday and Thursday nights and the World of Outlaws Sprint Car Series events Friday through Sunday. Brad Sweet, who comes into the event as the reigning Kevin Gobrecht Rookie of the Year, was second fastest behind Blaney with a time of 12.822. 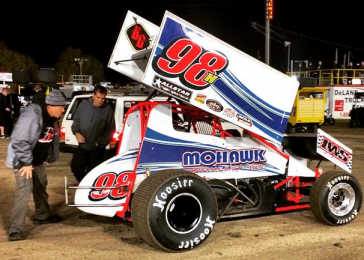 The Kasey Kahne Racing driver found success at Volusia in 2014, winning the Outlaws season opener.